Posted on August 8, 2016 at 10:00 am. Made of real, unfinished wood, WeWood watches are some of the most sustainable I’ve seen. The watch cases themselves are made from offcuts (leftover small wood pieces) in various kinds of wood, ranging from maple to slightly more unusual, and for each purchase, WeWood plants a tree. The company has planted millions of trees around the world. Watch bands come in various wood varieties (one is known to cause sensitivity in some people, so I’d avoid that one), leather, and fabric. I picked up a maple (the least likely to be allergenic) watch with interchangeable scarf watchband, and I love it! I can even wash the band regularly to get rid of allergens, and replace it with my own fabric when it gets old. Modern society’s expectation of a highlighter is a plastic marker casing containing neon liquid. 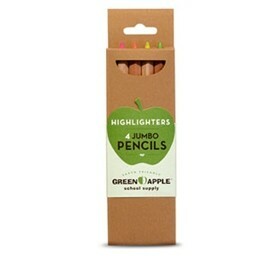 Green Apple challenges this with thick highlighter pencils. They will never dry out (so they last a LONG time) and shouldn’t cause fragrance of VOC allergies to flare. The marks they make are every bit as bright as a traditional highlighter, in pink, green, yellow, and orange. The pencils are made of natural, unpainted wood, and are biodegradable. The box is 100% recycled and carbon neutral, with electricity use offset 100% by wind power. This stuff is awesome. Two Canadian kids invented it for their “screaming” younger brother who couldn’t eat dairy. Creamy like ice cream, gently sweetened with honey and maple syrup, softer in texture than some coconut “ice creams,” this is the deluxe iced treat for dairy lovers who can’t eat milk products. It’s also free of the most common allergens, including gluten. 5% of their net profits are donated to children in need, they use fair trade and organic cacao, and their packaging is recyclable wherever recycling programs allow. They come in natural flavours like orange pineapple, key lime, chocolate, chocolate mint, maple, and mocha, and don’t contain a bunch of excess ingredients. Yum! These jars are made in Germany and imported to North America. They are one of the only jars currently produced to feature glass lids. Replaceable rubber rings form the seal, and metal clips hold them down (they’re not quite as simple or replaceable as the clamps on the old glass-lidded Bell jars, but those are hard to get nowadays). The jars come in multiple shapes and sizes, filling a large range of needs, from little jam jars to tall and skinny asparagus jars to easy-to-empty soup jars. The tulip jars are even pretty enough to be used decoratively. With Weck jars, you’ll have no more plastic storage containers and plastic-lined metal canning lids. The jars are infinitely reusable, and the only thing you’ll need to replace is the inexpensive rubber ring.